Seed cake seems a very old-fashioned kind of a cake and something I associate with elderly aunts along with sherry. My aunts, I hasten to add, aren’t at all old-fashioned and are definitely not of the seed cake & sherry drinking variety. I think it’s an image I got from childhood reading rather than any sort of reality. In fact both my aunts put me to shame whilst they were staying here. One had skin that was younger looking than mine and the other went out running before breakfast. Luckily, they both liked the cake. Funnily enough, they said it reminded them of visiting elderly relatives when they were young. This caraway seed cake thing seems almost guaranteed to tug at our childhood memories. 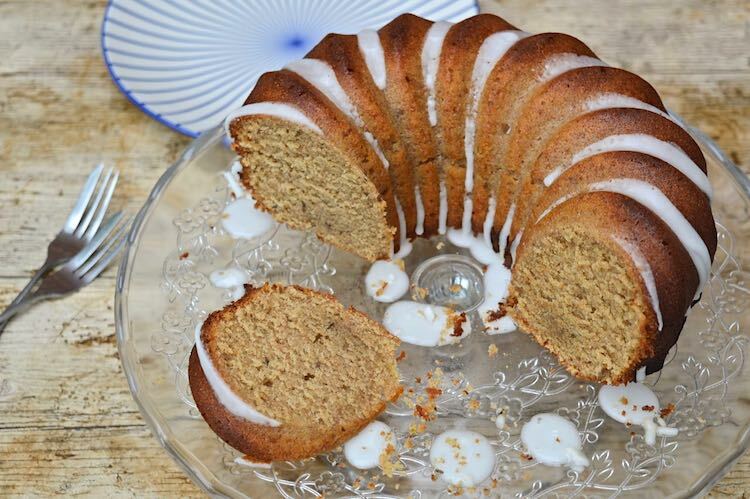 Seed cake is a plain buttery cake flavoured with caraway seeds. It really must be a vintage cake though, because when I googled “seed cake”, pretty much all that came up were recipes for poppy seed cakes. Well done Rachel Roddy for bringing such a delicious cake back to our consciousness. Here is Mrs Beeton’s take on a seed cake, from her Book of Household Management, 1861. INGREDIENTS – 1 lb. of butter, 6 eggs, 3/4 lb. of sifted sugar, pounded mace and grated nutmeg to taste, 1 lb. of flour, 3/4 oz. of caraway seeds, 1 wineglassful of brandy. Mode.—Beat the butter to a cream; dredge in the flour; add the sugar, mace, nutmeg, and caraway seeds, and mix these ingredients well together. Whisk the eggs, stir to them the brandy, and beat the cake again for 10 minutes. Put it into a tin lined with buttered paper, and bake it from 1–1/2 to 2 hours. This cake would be equally nice made with currants, and omitting the caraway seeds. Time.—1–1/2 to 2 hours. Average cost, 2s. 6d. 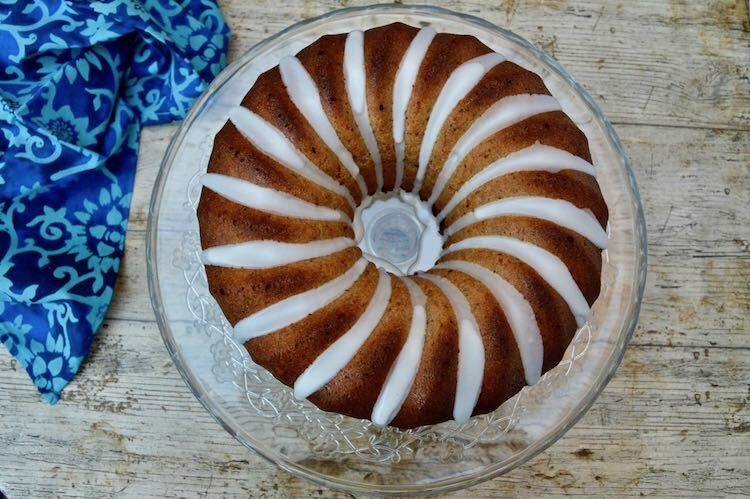 I decided to go very modern and bake my lemon caraway seed cake in a bundt mould. It didn’t take me long to decide. My silicon bundt mould, as seen in this A Tale of Two Bundts post, is now my favoured container for baking cakes. But don’t worry if you haven’t got one, a large loaf tin would do just as well. Wholemeal spelt was, of course, my flour of choice, but I also decided to add a little lemon zest and juice. I thought the lemon would freshen the cake up a bit and bring out the lemony notes of the caraway seeds. Rachel just states “sugar” in her recipe, so I went with a mix of light muscovado and golden caster sugars. I also used sherry rather than the madeira or marsala she suggests. It’s what I had in the cupboard and it seemed to be more fitting to an old-fashioned seed cake somehow. This is meant to be a plain kind of a cake, but I jazzed it up just a little with some lemon icing drizzled over the top. I must have made all the right decisions, because the cake was really really good. CT and my aunts appreciated it anyhow. Old-fashioned this lemon caraway seed cake might be, but sometimes the old ones are the best ones. I’m linking this lemon caraway seed cake up to #BakingCrumbs with Apply To Face Blog, #CookOnceEatTwice with Searching for Spice, #BakeOfTheWeek with Casa Costello and #CookBlogShare with Recipes Made Easy. Thanks for visiting Tin and Thyme. 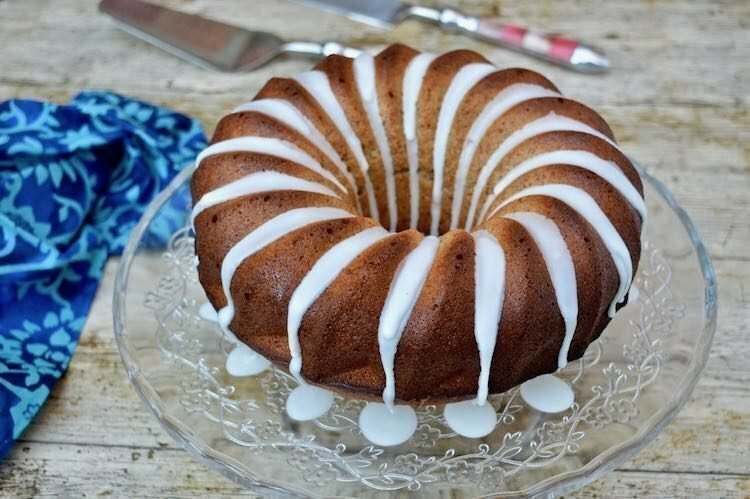 If you make this lemon caraway seed cake, I’d love to hear about it in the comments below or via social media. Do share photos on your preferred social media site and use the hashtag #tinandthyme, so I can spot them. For more delicious and nutritious recipes, follow me on Twitter, Facebook, Instagram or Pinterest. Lemon Caraway Seed Cake. PIN IT. An old-fashioned seed cake, jazzed up with a little lemon and sherry with a drizzle of lemon icing over the top. Turn on the oven to 180℃ (350℉, Gas 4). Grate in the lemon rind and add the caraway, then beat until combined. Beat in the eggs, one by one, adding a little of the flour if the mixture looks as though it's splitting. Sieve in half the flour and baking powder, then stir in half of the sherry. Repeat with the remaining flour, baking powder and sherry. Juice the lemon and stir in half until just incorporated. Spoon the batter into a greased bundt tin or a lined large loaf or round cake tin and bake in the centre of the oven for about 45 minutes or until a skewer inserted into the middle comes out clean (ish). Allow to cool in the tin for ten minutes, then turn out onto a wire rack to cool completely. Beat the remaining lemon juice with the icing sugar and drizzle over the cake in anyway you see fit. 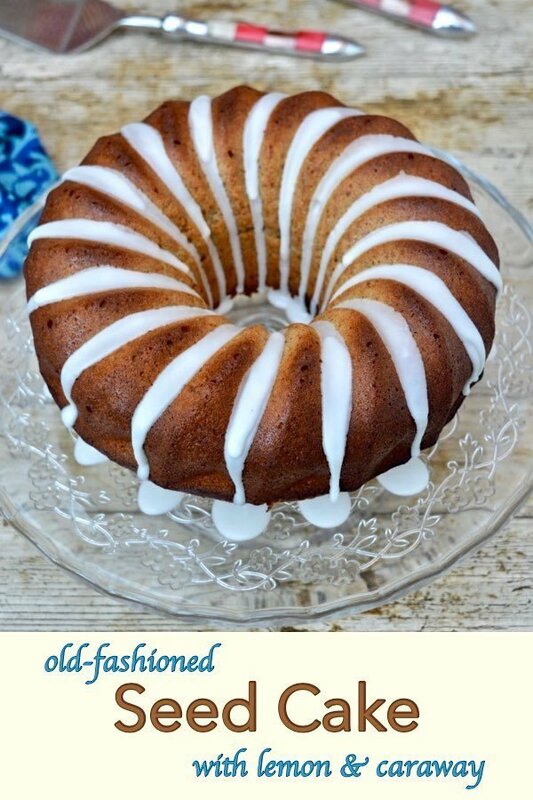 You can use a large loaf tin if you don't have a bundt mould. Please note: calories and other nutritional information are per serving. They're approximate and will depend on exact serving size and ingredients used. I always wondered what a seed cake was! This looks delicious, I will have to give it a try. It does sound perfect for visiting aunts! Hahaha, indeed. If you like caraway seeds, you’ll love this cake. Ah, you see I was right. Seed cake is a trip down memory lane. Yes, what happened to talcum powder? I haven’t, thankfully, seen any in years. I love Seed cake. My Mum used to make little Caraway seed buns. Oh gosh yes. Now you mention caraway seed buns, I remember those too. Oh, seed cake is an English classic Mandy. It has to be tried, at least once. So interesting as I have never heard of a seed cake. I love caraway so may need to try this and will definitely add the wine glass of brandy to mine. Hahaha Jere, the wine glass of brandy does sound rather good. Let me know how it goes. I love the unusual yet very delicious combo of flavours! The cake looks not only beautiful also so good! Thanks Angie. Seed cake with caraway is a British classic. The lemon addition was entirely my idea. Oh Jo, it is a bit sad that some of these old cakes aren’t better known. Seed cake isn’t something I particularly liked as a child, but I love it now. Oh I can imagine the flavours of this work so incredibly well together. What a treat. Definitely one to try. I love that your aunts put you to shame. One of mine cycled round the entire coast of mainland Britain a few years ago to celebrate her 60th. I’m looking forward to feeling that good when I’m 60! I’m not sure I’ve ever had a seed cake but this one looks delicious – a great place to start. Oh, go your aunt, that’s really something. I don’t think I’ve ever been fit enough to do something like that. Mine are both nearer to 80 than 60. Oh I am glad you reminded me how nice seed cakes can be! Poppy seeds are one of my favourite to use. This cake sounds right up my street – anything with spelt flour gets a big tick from me. I also think my husband would adore this cake – I might just have to bake it for him as a surprise. Thanks Jane. I’ve been baking with spelt flour for more years than I care to remember. It works really well I find. I’d never heard of a seed cake before! I wonder if it’s just something that wasn’t very popular in my family as all my older relatives like baking and used to bake cakes when we visited when I was a child. I’d love to try it though as it sounds delicious. Thanks for sharing with #CookOnceEatTwice! It was old-fashioned even when I was a child. I remember trying it way back when and not being very impressed. I think caraway seeds are more to an adult’s taste than a child’s. Thanks Rebecca. It’s a really nice cake. It’s a shame seed cake is so underrated. I’m sure this would work well for you with gluten-free flour. Let me know, if ever you try it. I do not know if I have eaten a slice of seed cake. I would love to try a slice of yours though, because it looks so light and tasty. The simple iced decoration suits thew shape fo the cake perfectly. I love that an old fashioned recipe is being given some love and recognition. Please don’t apologise Jenny. Life often gets in the way I find. Thanks for the kind comments. It’s a shame that some of these more old-fashioned cakes don’t get a bit more love. 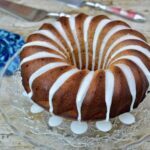 I love the idea of using caraway seeds in a cake recipe! I’ve only ever had them in savoury dishes. Your cake looks super neat too! Pinned!